Petition handed in to Order's headquarters signed by over 20,000 people from Drogheda who want to see the town's Dominican church stay open. Three members of the Dominican community in Drogheda undertook a marathon 57km ‘walk of hope’ at the weekend to Tallaght in Dublin in a bid to save their local church. Led by the Prior, Anthony McMullan, the party left the Dominican church in Drogheda on Saturday at 7am and arrived in Tallaght at 5pm. At the end of their journey the friars handed in a petition to the Dominican headquarters signed by over 20,000 local people in Drogheda who want to see the church stay open. The Dominican Church has served the people of the Co Louth town for 800 years. Last September, the Order announced Drogheda as one of five locations in Ireland that would close. There was considerable surprise as the town also has the historic Dominican Siena Convent, giving the Dominicans a combined presence of 1,000 years by the Boyneside. Speaking about the walk, Fr Bernard Tracey, spokesperson for the Order said the decision to withdraw from Drogheda had not changed and consultation with stakeholders was continuing. Thirty years ago, we had 400 friars in 16 centres; now we have 150 in 19 centres and we cannot continue to serve in all centres,” said Fr Tracey. “Our numbers are stark but how we implement the decision is open to consultation. Consultations are taking place concerning each house where the decision was made to withdraw. Members of the provincial council have been appointed to convene and chair the consultations in each area. The consultations involve representatives of people attending each church as well as representatives of the parish and of the diocese,” he said. However, Rita Hanratty, spokesperson for the ‘Save the Dominican Church’ campaign in Drogheda, said there are alternatives. She said this could be done without any cost to the order. Her husband Declan Hanratty is the sacristan at the church. He went on hunger strike last year in an effort to have the decision reversed. 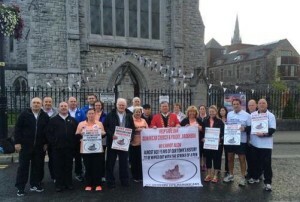 Twenty-seven people joined the Friars to take part in the walk in support of keeping the order in Drogheda.